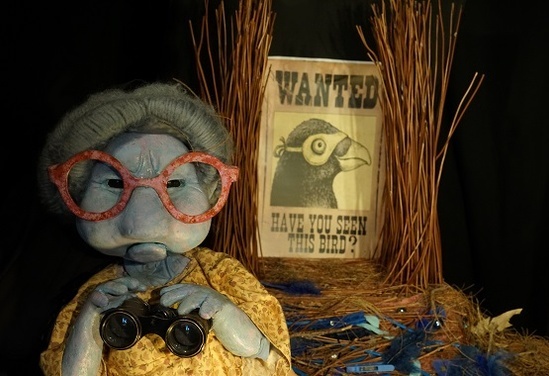 A Little Bit of Blue is an interactive environmental detective story, performed by Jenny Ellis, which combines puppetry and physical comedy. As well as unraveling a mystery, it involves learning about the unique habits of an extraordinary Australian creature, the Satin bowerbird, and their fascination with the colour blue. The story begins with strange disappearances from Mrs Mavis Hooley’s home. Something has just gone missing and is nowhere to be found. Mrs Hooley has been looking everywhere. But it’s not just today. Every day a new thing seems to disappear. Little things. A $10 note. Clothes pegs. A ball of wool. It’s troubling at first, but then the thief takes it one step too far. Mavis calls in a Detective to investigate. They set a trap for the burglar. A stake out is required. In the dead of night, and the Detective indeed finds something peculiar.... The children’s role is to help him solve the case. The style of puppetry used in the show is inspired by Bunraku, a Japanese form of theatre. In traditional Bunraku, puppeteers are not hidden, even though they are often dressed in black, but are seen working the puppet. Contemporary theatre has borrowed this technique, with recent examples including Warhorse and The Lion King. In this production, Jenny plays a Detective as well as manipulating the puppets on the stage. The interesting thing about this technique is audience still suspends their disbelief, and believes in the characters, even though their manipulation is clearly visible. 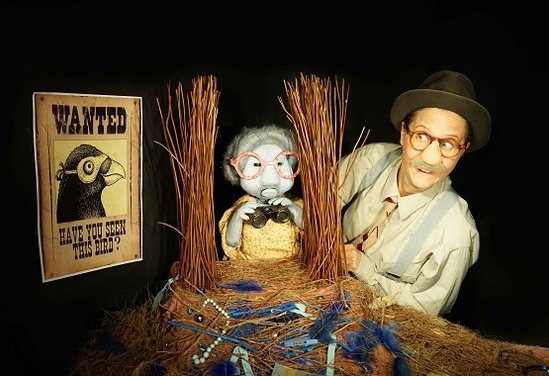 A Little Bit of Blue is an interactive detective show for families, told with puppetry.